The remaining 17 groups that make up the Syrian portion of Operation Olive Branch are a combination of Salafist, jihadist and ultra-extremist militants who have been either formed or supported by Turkey at various stages of Syria's seven-year civil war. 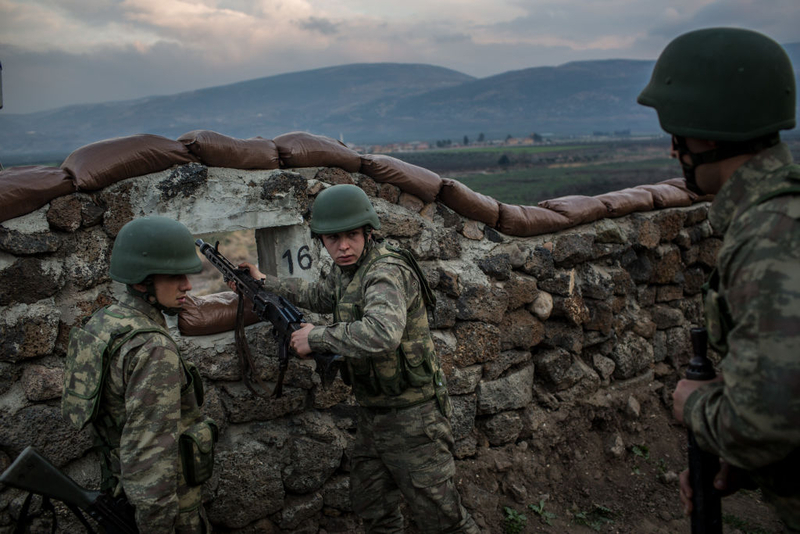 In its offensive launched on January 20 against Kurdish fighters in northern Syria, Turkey has deployed more than 25,000 Syrian rebel fighters who have been equipped and trained by Turkish President Recep Tayyip Erdogan's powerful military. The offensive, code-named Operation Olive Branch, aims at dislodging the Kurdish People's Protection Units (YPG) from the Kurdish enclave of Afrin. On March 18, Turkish military and allied jihadist rebels took control of Afrin's city center. Turkey views the YPG as an extension of the Kurdistan Workers' Party (PKK), an insurgent group that has been fighting for greater Kurdish autonomy in Turkey's southeast. Backed by the United States, the YPG has been instrumental in the U.S.-led war on terror in Syria since 2014. Nine days after the start of the operation, the pro-Turkish government website, Suriye Gundemi, published an infographic showing the Syrian rebel groups involved in the Afrin offensive. The website says that three divisions are part of the National Army that is under the command of the Syrian interim government, an anti-Syrian regime body based in Turkey. This so-called army consists mainly of Islamist militants who were part of the most radical Islamic factions of the Free Syrian Army (FSA) at some point during the Syrian conflict, and was formed only two weeks prior to the Afrin operation. Most of these fighters fled to Turkey after they were defeated in battles across Syria, including in Damascus, Aleppo, Homs, Idlib and Hama. While in Turkey, they were recruited by Turkish intelligence agencies to be part of forces invading the Kurdish-held Afrin. Named after the notorious Ottoman Sultan Mehmed the Conquerer, who ruled in the 15th century and violently conquered Constantinople and Southeast Europe, this ethnic Turkmen group was founded in 2012 at the height of the Aleppo battle. It controlled six districts in eastern Aleppo, imposing a set of sharia (Islamic) laws on local residents. The group commanders were also involved in criminal activities, such as robbery and human trafficking. The group was later embraced by the Turkish government, and thus it participated in Operation Euphrates Shield, another Turkish-led offensive in northern Syria, which ended in March 2017. It has close to 1,000 fighters. An extremist group established by Turkey in 2013, it receives direct financial, military and logistic support from Turkish armed forces. Most of its fighters are ethnic Turkmen. Prior to the Afrin offensive, it was primarily based in the city of Aleppo. The group has been involved in clashes with other rebel groups over revenue sharing of the Bab al-Salameh border crossing when a rival group decided to hand over the crossing to the main Syrian opposition body. Founded in April 2016 in Turkey, it was one of the first Turkish-backed Syrian groups that entered the Syrian town of Jarablus in 2017 alongside the Turkish military. Adopting an extremist anti-Western Islamic ideology, the group strongly believes in the return of Ottoman rule over the entire Middle East. Originally named the Homs Legion, the group that was established in March 2014, has nearly 4,000 fighters, making it the largest force within the Operation Olive Branch. It is a union of at least 19 Islamist groups affiliated with the Syrian branch of the Muslim Brotherhood. The group joined other rebel forces in forming the Fateh al-Sham operation center. It has been active in the provinces of Aleppo, Idlib and Homs. The group is currently led by Yasser Abdulrahim, a rebel leader known for changing sides based on funding sources. The second largest rebel group participating in Operation Olive Branch, the Shamiyah Front is a union of Islamists and Salafists from Aleppo. Its members are largely remnants of the Nureddine al-Zanki Brigades and other extremist groups that were active in Aleppo in 2015. Supported by Turkey and Qatar, this rebel group believes that jihad is the only path for Syria to become an Islamic emirate governed by sharia law. It has an estimated 3,000 fighters. Named after the Zawiyeh Mountain in the northwestern province of Idlib, the group was active in Idlib's countryside. It was originally part of the Descendants of the Prophet Brigades. It clashed with the al-Nusra Front, al-Qaeda's Syrian branch, over revenue and power sharing. Defeated by al-Nusra, its members were forced to flee to Turkey, before regrouping and joining the Afrin operation. The group is made up of smaller groups that operated in Idlib, Hama and Latakia. Named after the Islamic prophet Mohammed's title, the faction was founded in June 2016 with the financial and military support of Turkey. It participated in Operation Euphrates Shield. 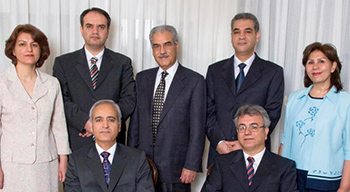 Named after Saad bin Abi Waqqas, a companion of the prophet Mohammed and the 17th person to embrace Islam, the group was formed in early 2016 by the Turkish government. It has nearly 1,000 well-trained fighters. Named after al-Muntasir bi'llah, the Abbasid caliph who ruled in the 9th century, this Syrian rebel group has embraced a radical Islamic ideology since its inception in February 2014. Based in Aleppo and Raqqa, it has engaged in several battles with Syrian regime troops. The group welcomed the arrival of ISIS in Raqqa and did not attempt to challenge its rule. After Aleppo was retaken by the Syrian military, most of the group's fighters fled to Turkey, where they went through an organizational restructuring. They played a central role in launching Operation Euphrates Shield. Named after Suleyman Shah, the father of Omsan I, founder of the Ottoman Empire, this group was formed in Turkey in April 2016 to participate in Operation Euphrates Shield. Its fighters are largely ethnic Turkmen, with a significant percentage of Sunni Arabs. It is currently led by Mohammed al-Jassim, also known as Abu al-'Amsha. Named after the Uzbek city of Samarkand, this is another Turkmen group that was formed by Turkey in April 2016. In its inaugural statement, it said that its main objective was to fight the Kurdish YPG. The group is led by Wael Musa. These smaller groups that were formed in Syria and Turkey. Each group reportedly has 200-300 fighters who are commanded by the Turkish military and larger rebel groups. Sirwan Kajjo is a Syrian-Kurdish Washington-based journalist and author. Erdogan is an Islamic totalitarian fascist and has said Europe will be Muslim...he has called for Muslims in Europe to have many more children than native Europeans so that this process of Islamization takes place faster. Pope John Paul II had a vision of Islam taking over Europe that has come out recently by his close confidant to warn if nothing is done, this will happen, and Europe and freedom and civilisation will be over...too late to cry when that happens... PRAY, PRAY PRAY daily and fervently. The Kurdish people were some of the greatest opponents of ISIS and fought magnificently against the heathen force. They now face another heathen force who are backed by Erdogan of Turkey. Not a murmur from the EU condemning the fact that Erdogan is simply using another Islamic group or groups to do his dirty work and is encouraging the fight against Kurdish fighters in order to dislodge them. He knows that the Kurdish people are opposed to him and his ultra Islamic programme that means to rid Turkey of them. Why is there no condemnation for this action by a member of the UN? It does seem to be following a trend whereby the Muslim lead countries are able to carry out attacks and atrocities in any area they see fit without a word of opposition being uttered! It's almost as if the rest of the world is frightened to say anything! I sincerely hope that the US and GB support the Kurds and send in arms and ammunition and whatever else will aid them in their fight against yet another Muslim bully boy. This one is a wolf in sheep's clothing, he wears a suit to give the impression to the world that he is civilised. He's not! Turkey is a Islamic terror center so why is it still in NATO? Yes. Very good question. I have often wondered this myself--beggars investigation asap.